Armenia, a small territory of 29.750 sq. km, is situated in Southern Transcaucasia, a mountainous region in the North Eastern part of the Armenian Plateau. It is one of the most ancientcountries in the world and exists since the times of Babylon, Assyria and Egypt. In 301AD Armenia adopted Christianity as an official religion, the first country in the world to do so. From its capital Yerevan, founded in 782 BC, one can see the most spectacular Ararat mountain in all its splendor. It is on that eternal snow and glacier capped mountain (5165m high) that Noah's Ark came to rest after the Big Flood. Modern Yerevan is built largely of tuff, the country's attractive pink volcanic stone. It has a population of 1,2 million people representing one third of whole Armenian population. Yerevan is also the country's administrative and cultural center, and despite economic difficulties, it is a vibrant city with busy markets and sidewalk vendors, numerous open cafes and parks. It is fascinating to know that in Armenia one can see a wealth of historical sites, monuments and archaeological discoveries, some dating back as far as 2-1 mil. BC and many of them well preserved. It embraces cave cities and ancient observatories, Urartian fortresses and cuneiforms, ancient temples and first Christian monasteries carved in hillside rocks. 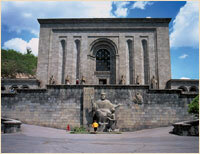 For its rich cultural legacy Armenia is considered an open book for the history of humanity. Visitors to Armenia will walk on the very Silk Road the rich caravans used on their passages from China to the Middle East and Rome.Armenia offers a striking variety of natural beauties and micro climates ranging from sun-burnt deserts in the mountain valleys to alpine meadows, from lush forests to eternal snow on the mountain peaks. With most of its territory being a natural mountainous environment, Armenia is an ecologically clean country with an abundance of pure water and natural mineral springs. The Ararat valley is very fertile with endless fruit orchards such as apricots, peaches, pears, pomegranates as well as vineyards producing excellent wine and cognac. 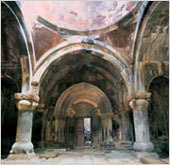 Traveling through Armenia visitors will find a friendly nation where people have kept their culture and traditions. They will also discover the many other interesting facets of Armenian life, taste the famous Armenian bread lavash, eat barbecue prepared in tonyr (special oven dug in the ground), and generally appreciate the life of the one of the most ancient nations in the world. This is a small country, but like the drop can tell about the ocean, Armenia reflects the history of mankind.